China conducted the third flight test of a new hypersonic missile this week as part of its strategic nuclear program and efforts to develop delivery vehicles capable of defeating U.S. countermeasures, defense officials said. 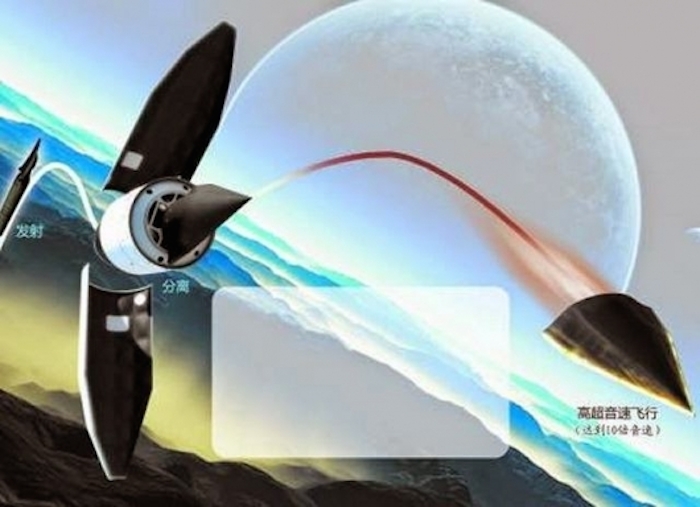 The flight test of the developmental Wu-14 hypersonic glide vehicle was monitored by U.S. intelligence agencies Tuesday during a flight test in western China. The latest flight test followed earlier tests of the Wu-14 on Jan. 9 and Aug. 7. The three tests indicate that China’s development of a strike vehicle capable of traveling up to eight times the speed of sound is a high-priority element in China’s large-scale military buildup. “We are aware of reports regarding this test and we routinely monitor foreign defense activities,” Marine Corps Lt. Col. Jeff Pool told the Washington Free Beacon. Last month in Beijing, the United States and China agreed to a new military accord that called for notifying each country of major military activities. It could not be learned if the Chinese notified the Pentagon in advance of the Wu-14 test. The Wu-14 was launched atop a Chinese ballistic missile and released along the edge of space. Past tests of the glide vehicle were clocked as reaching an estimated speed of Mach 10, or 10 times the speed of sound—around 7,680 miles per hour. Such speeds create difficult aeronautics and physics challenges for guidance systems and place extreme stress on materials used in construction of the vehicle. The annual report of the congressional U.S.-China Economic and Security Review Commission, made public Nov. 20, reveals China’s hypersonic weapons program is a major development effort. “Hypersonic glide vehicles could render existing U.S. missile defense systems less effective and potentially obsolete,” the report said. 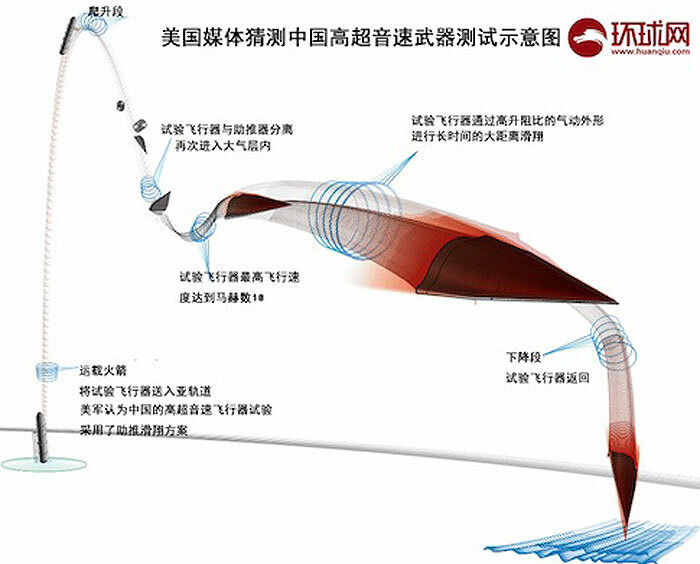 China plans to deploy its high-speed glide vehicle by 2020 and a scramjet powered hypersonic vehicle by 2025. “Of great concern would be if [China] was to apply the same technology and capability with a conventional warhead or even just without a warhead because of the kinetic energy that it has in combination with their theater ballistic missiles … in a theater role,” Fuell said. “If that is combined with more traditional ballistic missile attacks forcing a target to defend against very high aspect warheads coming in this way at the same time they have to defend against low altitude, very high speed targets coming in [another] way, it makes the defense problem orders of magnitude worse for the defender,” he said. The commission report stated that China is expanding its strategic nuclear forces “significantly,” with deployment of new missiles, submarines, and multiple-warhead weapons. Rick Fisher, a China military affairs analyst, said more tests are needed for China to turn the Wu-14 into a working weapon. The Wu-14 is part of what military analysts have said in a growing hypersonic arms race involving China, Russia, and the United States. Russia’s government announced last month that Moscow plans to field hypersonic missiles by 2020. By contrast, U.S. development of a hypersonic weapons program has been limited. The Aug. 25 test of the Army’s Advanced Hypersonic Weapon ended in disaster after the booster launching the weapon blew up shortly after launch from a test base on Kodiak Island, Alaska. Funding for hypersonic weapons development also has been limited to around $360 million dollars, an amount critics say is small compared to estimated investments by China. The Pentagon should fund several types of hypersonic systems in a development competition, Fisher said, as well as further research in counter-hypersonic arms. Past Pentagon research has included development of both guided-but-unpowered glide vehicles, and high-technology scramjet-powered hypersonic vehicles. 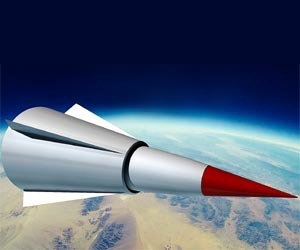 A space plane called the X-37 also is being developed as part of a program known as conventional Prompt Global Strike. U.S. intelligence analysts have said the current Chinese Wu-14 program is currently part of its strategic nuclear program. However, China also could use the Wu-14 as part of its conventional strike program, such as planning attacks on aircraft carriers in the western Pacific. “While missile based counter-systems may provide an early solution, there is much more potential in the realm of energy weapons,” Fisher said. “For example, rail guns offer great potential for early solutions to maneuvering hypersonic weapons and this technology deserves much greater funding,” he said. Fisher also said the United States should increase capabilities for targeting China’s space and high altitude reconnaissance and surveillance systems, to include satellites. “These will be absolutely necessary for China to successfully employ its long range hypersonic weapons,” he said. A Chinese Embassy spokesman could not be reached for comment. Lora Saalman, an expert on China’s hypersonic development at the Carnegie Endowment, said after China’s second Wu-14 test in August that the closeness of the first two tests showed that Beijing is “fast-tracking” the strategic program. “When compared with the yearly gaps in between its [anti-satellite] and [ballistic missile defense] tests in 2007, 2010, 2013, and 2014, the WU-14 accelerates China’s development timeline exponentially,” she said in an email in August. Saalman believes the Wu-14 is part of a Chinese version of the U.S. conventional Prompt Global Strike program. Lora Saalman, an expert on China’s hypersonic development at the Carnegie Endowment, said China’s third test of the Wu-14 in one year is unusual. “Not only does this third test of the WU-14 in one year indicate that this is a priority program for China, it also suggests that U.S. historical concerns over a Chinese quantitative ‘sprint to parity’ in nuclear weapons are misdirected,” she said. “The National Air and Space Intelligence Center has said in open testimony before the China Commission that the vehicle is nuclear and there may also be a conventional version,” Schneider said. Beijing's significant military advance has been furthered with its venture into hypersonic weapons systems. China is working on hypersonic cruise missiles for which it is working on scramjet engines and also on Hypersonic Glide Vehicle (HGV). In 2014, Beijing has conducted three test-firings of its HGV, the Wu-14. The first test-firing was conducted in January, while the second one was conducted in August and the latest one has been conducted in December and witnessed both success and failure with the tests. This "game changer"3 Wu-14 is designed to be mounted atop ballistic missiles to "an undisclosed suborbital altitude and then released." The vehicle then dives towards its target at speeds of up to Mach 10. There is little doubt that this 'assassin-mace weapon' is another category of counter-measure being developed by Beijing to evade the US missile defence systems.4 The dragons have time and again raised their apprehensions on the US missile defence program and oppose the same on the grounds that it negates Beijing's nuclear deterrent capability. Beijing has been developing counter-measures like decoys and chaffs on their ballistic missiles. China is also making its ballistic missiles fly either a depressed or lofted trajectory as counter-measures against missile defence system. China is also working on multiple independently targetable re-entry vehicles (MIRVs)5 and maneuverable re-entry vehicles (MARVs)6 which could nullify US missile defence systems, both National Missile Defence (NMD) and Theatre Missile Defence (TMD). Evasion of ballistic missile defence is possible due to the high speed at which these systems travel and also because of their flat trajectory7 which makes it difficult for missile defence system to defeat the system. Apart from enabling ballistic missiles to nullify US missile defence system, this system mounted atop a ballistic missile also increases range the range of the missile. Missiles with depressed or lofted trajectories reduce the range of the ballistic missile system. The same is the case with MIRVs, which also reduces the range of the ballistic missile. Reports confirm that the HGV could be mounted atop the Chinese DF-21D anti-ship ballistic missile (AShBM)11 which can put the US aircraft carriers at threat. This Wu-14 could also increase the range of the DF-21D AShBMs and enable them to target the US Navy nuclear powered carriers (CVN) even if they are stationed at a considerable distance. The United States is also working on the Hypersonic Technology Vehicle (HTVs) and Advanced Hypersonic Weapons as a part of its 'Prompt Global Strike' strategy. In 2014 China has also been conducting test firings of its intercontinental ballistic missiles (ICBMS) which included the DF-41s, DF-31s and the DF-5 category ballistic missiles. There is little doubt that the hypersonic race as started already and states like the United States, Russia, China and India are already gearing up their technology to keep pace with each other. The DF-ZF HGV warhead is carried to the boundary between space and Earth's atmosphere, roughly 100 km above the ground, by a ballistic missile booster. China has conducted a sixth flight test of its DF-ZF (previously known as WU-14) hypersonic glide vehicle (HGV) designed to defeat US missile defenses. "The DF-ZF is an ultra-high-speed missile allegedly capable of penetrating US air defense systems based on interceptor missiles," Bill Gertz of The Washington Free Beacon wrote. The DF-ZF HGV was launched at the Wuzhai missile test center in central China's Shanxi Province. It was transported by a ballistic missile near the edge of the atmosphere, where it separated from its launcher and then glided to an impact range a few thousand kilometers away in western China, according to The Washington Free Beacon. "The DF-ZF flight was tracked by US intelligence agencies and flew at speeds beyond Mach 5, or five times the speed of sound," Gertz noted. "Once it reaches that height, it begins to glide in a relatively flat trajectory by executing a pull-up maneuver and accelerates to speeds of up to Mach 10." The Chinese Defence Ministry this week confirmed the fourth test of a hypersonic nuclear delivery vehicle. The US called it an “extreme manoeuvre,” amid rising tensions between the two powers in the South China Sea. China tested the missile just days before the Central Military Commission vice-chairman Fan Changlong left for the U.S. on a week-long visit. Military observers told the South China Morning Post that the missile test reinforced China's nuclear deterrent in response to the United States' interference in South China Sea disputes. The advanced strategic strike weapon travels at speed of up to 10 times the speed of sound, or more than 7,600 miles per hour. In its 2014 report, a congressional China commission stated: "Hypersonic glide vehicles could render existing US missile defence systems less effective and potentially obsolete." Designed to be less susceptible to anti-ballistic missile countermeasures than legacy re-entry vehicles, the WU-14 is likely to be fitted to various Chinese ballistic missiles. The People's Liberation Army Rocket Force has conducted two flight tests of a new ballistic missile attached to a hypersonic glide vehicle (HGV), US officials confirmed in a recent intelligence assessment. The two DF-17 ballistic missile tests occurred November 1 and November 15, respectively, a US official briefed on the intelligence assessment told the Diplomat on December 28. The November 1 test was the first ballistic missile test since the Communist Party of China's 19th Congress in October, the report notes. The November 1 test comprised "the first HGV test in the world using a system intended to be fielded operationally," the US official told the news outlet. The US and Russia have been hard at work on honing hypersonic glide technology, but neither country is known to have conducted HGV tests for a system intended to become operational. The HGV used in the November 1 test was designed specifically for the DF-17, a medium-range ballistic missile, according to the Diplomat. The missile landed "within meters" of its intended target and is expected to become fully operational in 2020, according to the US intelligence assessment. The primary appeal of HGVs is that they are thought to be less vulnerable to missile defense systems. Given the high speeds at which the vehicles can transport payloads, missile interceptors do not have as much time to neutralize the projectile before the payload reaches its target, the Daily Beast reports. "The combination of high speed, maneuverability, and relatively low altitudes makes [HGVs] challenging targets for missile defense systems," a National Air and Space Intelligence Center report released in June stated. HGVs fly faster than Mach 5 "and spend most of their flight at much lower altitudes than a typical ballistic missile," the June report says. "Although hypersonic glide vehicles and missiles flying non-ballistic trajectories were first proposed as far back as World War II, technological advances are only now making these systems practicable," James Syring, director of the US Missile Defense Agency, told the House Armed Services Committee in June.